The ending of the Fire Season and the beginning of the Winter Backpacking Seasons of 2018 happened at the same time, during the storm that came through during the 21st through 23rd, which should be considered the second storm of this longest of fire seasons, if we're counting the series of isolated downpours we experienced in early October as this season's first. Six inces to a foot fell on the Sierra Crest from the storm activity between the 21st and 23rd. Snow Sensor Readings for 11-22. Clicking stations will give today's reports. First precip since the scattered downpours on October 2nd (backpacker's calendar), and the 26th of May (backpacker's calendar), before then. 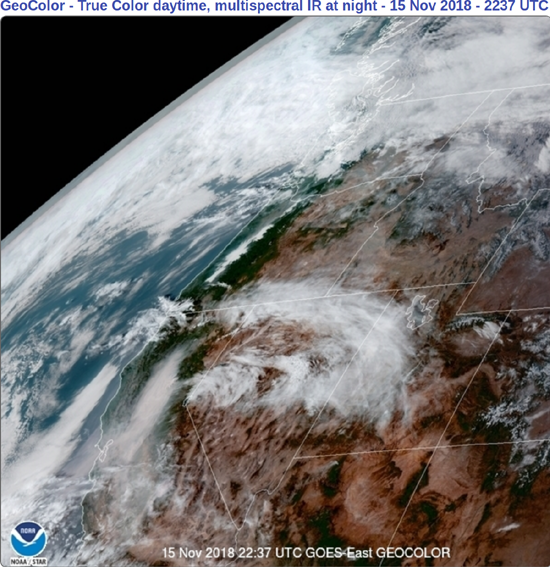 Major Smoke from the Camp Fire, just under 50% containment today, is covering and trapped over North California & North Sierra, running South down the Western Flank across Yosemite and Sequoia, while pushing East through the Delta to fill San Francisco Bay. Yet, conditions at Lake Tahoe and points South along the Sierra Crest and its East Flank are pristine. The number of missing people climbed to 630 today, as confirmed fatalities reached 63. No precipitation is expected until 6 pm next Tuesday, and the forecasted precip has strengthened (better than weakening!) since yesterday. Mid-November, 2018: Will it Be Wet, or Will it Continue to be Bone Dry? We've had no precipitation of note since May, except the brief deluge on October 2nd (calendar). We've had warm, temperate and generally gentle weather through all of October, since the heat, heavy smoke, and firestorms of Summer finally tapered off through September (calendar). Clear Conditions can now bring Deep Cold! Stormy Conditions will bring Snow! Conditions are currently ideal for Fall Backpacking in the High Sierra, if certain precautions are taken. First, we've got to understand that the temps can plunge. Proper insulation for a worse-case weather scenario is vital. Second, we understand that a freak storm can blow in, bringing Winter conditions to the High Sierra early, if the storm comes out of the cooling Northwest. A freak storm out of the tropical seas to our Southwest can scour the Crest with lightening and slushy downpours, while pounding the flanks with tropical downpours. La Nina to El Nino? NOAA is talking-up the odds of an El Nino, of a buildup of hot water in the Central-West Pacific sliding East into an El Nino configuration, I don't see it happening... well, I put the odds of an El Nino building this Winter at less than half of where NOAA is setting them. Temps have been rising and falling in a gentle cycle between warm and cool since the middle of September, without generating heat waves nor early freezes. Humidities have been elevated. We've seen indications of potential heat waves and possible cold snaps, but neither have manifested themselves, so far. Both are still possible. All the epic fires of July and August have diminished, some of the biggest are contained, with most of the others presenting less threat. That's good, because the firefighters need a break. But, if you need an easy to view list of all active national fires, their size, and their crews, acres, equipment (and more info), well, that organization has all been lost to a pathetic google map that presents no real or compiled information at a glance, as did Inciweb lists of the previous design, along with its direct reference pages to the fire activity in each of our National Forests and Parks...all that valuable information and organization has been lost in this crappy "upgrade." I'd call it a, "digital downgrade," a "de-organization" of previously organized information. The old presentation should have been preserved, and the new crap-map offered as a "mobile-option" for the cell-phonies. Latest station readings, with last ten days readings, too! Last readings, but adding All "Webcam Layers,"
gives us eyes on the smoke! Check out the various webcam, "layers," or networks. CA/NV 2-km 72 hr Forecast Nov. 19, 2018: showing projected end of Camp Fire Smoke! Warm & Dry, no precip, except Oct 2. The cool Spring that preserved our weak snowpack through June, longer than its bulk would have indicated, has given way to warm, dry fire conditions and fires more typical of August. Despite, or maybe because this 2016-17 massive Winter snowpack broke our five-year long super-drought, we are having an active and increasing fire season. Massive grasses and Spring growth from the excessive moisture are now acting as kindling for the hundred million drought & beetle killed trees in the Sierra. With this kind of heat my mind turns to the question, "is the drought over, with one wet Winter?" We will see this next Winter, if one even comes. The "big" patterns in the sky controlling the character of our seasonal weather and its transitions between seasons is damaged, if not broken. The only thing our future weather holds is deep uncertainty. This is the page where you can access all fire, warnings, and restrictions information covering High Sierra National Parks and Forests. This page here links to the "Alerts, Notices, & News"
on Forest & Park pages for specifics of their current fire restrictions. Though we had a marginal, slightly below "normal" Winter, the consequences of the past 5 years of unprecendeted drought have caught up to the Sierra's Western Flank Forests in terms of a massive die-off. A quick review of the Changing Weather News here and here and here all show the depth and width of this impending disaster of monumental porportions. The Smoke and Fire Information resources are becoming more valuable every year. As last year, I suggest that backpackers monitoring of climate conditions include watching fire and smoke conditions, and that our backpacking plans now incorporate fire plans. A fire plan is awareness of our various escape routes. A historic fire year after years of drought is forming up. I expect fire bans early in the season up and down the Sierra Crest. I suggest that backpackers monitoring of climate conditions include watching fire and smoke conditions, and that our backpacking plans now incorporate fire plans. San J Mercury, May 12, 2014. After the (Rim) Fire: The Uncertain Future of Yosemite’s Forests, Wired, Aug. 30, 13. Wildfires projected to worsen with climate change, Harvard, August 28, 2013. NASA's Landsat Revisits Old Flames in Fire Trends, NASA, Aug. 29, 2013. Amazon Forest Fire Risk to Increase in 2013, NASA, June 7, 2013. Fires Plague Portugal, NASA, August 27, 2013. Clean Spring this year, not nearly as "messy" as last year's stream of weak Spring storms. Big Fire Season pending end of "Spring," if it waits that long. The "mucky" weather from May 6 to May 25 has not padded the Sierra snow, but has suspended the drying out process for a time. Sloppy weather continuing through early July. As of August 26 I am delaying travel into the North Sierra Nevada until the fires end and the smoke clears. Heavy smoke has been crossing the Sierra moving Northeast blanketing parts of Western Yosemite National Park, Emigrant, Carson-Iceberg, Mokelumne Wilderness. Wind changes have brought smoke into the San Jaquine Valley and Yosemite Valley. The Tahoe Basin, Reno, and Carson City are also reported to be suffering under heavy smoke. My best wishes go out to those threatened by these fires.